Librarian's note: See alternate cover edition of ISBN 0785263705 here. "I never liked jazz music because jazz music doesn't resolve. I used to not like God because God didn't resolve. But that was before any of this happened." ―Donald MillerIn Donald Miller's early years, he was vaguely familiar with a distant God. But when he came to know Jesus Christ, he pursued the Chris Librarian's note: See alternate cover edition of ISBN 0785263705 here. "I never liked jazz music because jazz music doesn't resolve. I used to not like God because God didn't resolve. But that was before any of this happened." ―Donald MillerIn Donald Miller's early years, he was vaguely familiar with a distant God. But when he came to know Jesus Christ, he pursued the Christian life with great zeal. Within a few years he had a successful ministry that ultimately left him feeling empty, burned out, and, once again, far away from God. 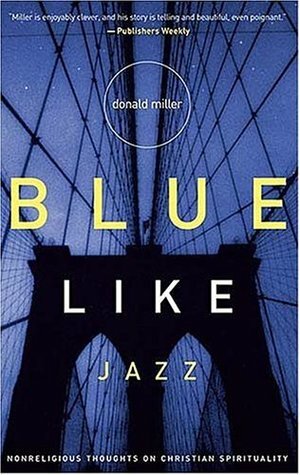 In this intimate, soul-searching account, Miller describes his remarkable journey back to a culturally relevant, infinitely loving God.For anyone wondering if the Christian faith is still relevant in a postmodern culture.For anyone thirsting for a genuine encounter with a God who is real.For anyone yearning for a renewed sense of passion in life.Blue Like Jazz is a fresh and original perspective on life, love, and redemption.